ST. THOMAS was born of noble parents at Aquino in Italy, in 1226. At the age of nineteen he received the Dominican habit at Naples, where he was studying. Seized by his brothers on his way to Paris, he suffered a two years’ captivity in their castle of Rocca-Secca; but neither the caresses of his mother and sisters, nor the threats and stratagems of his brothers, could shake him in his vocation. While St. Thomas was in confinement at Rocca-Secca, his brothers endeavored to entrap him into sin, but the attempt only ended in the triumph of his purity. Snatching from the hearth a burning brand, the Saint drove from his chamber the wretched creature whom they had there concealed. Then marking a cross upon the wall, he knelt down to pray, and forthwith, being rapt in ecstasy, an angel girded him with a cord, in token of the gift of perpetual chastity which God had given him. The pain caused by the girdle was so sharp that St. Thomas uttered a piercing cry, which brought his guards into the room. But he never told this grace to any one save only to Father Raynald, his confessor, a little while before his death. 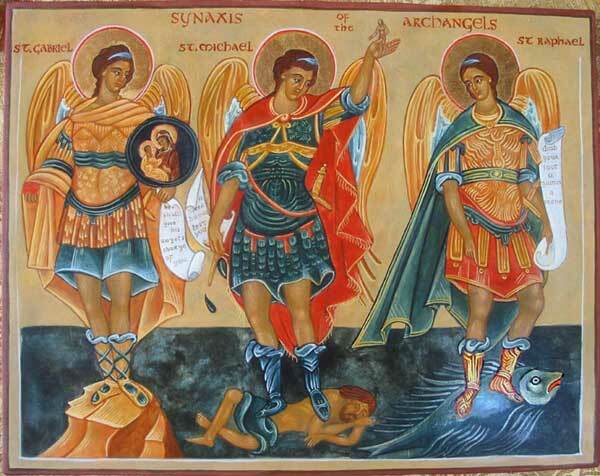 Hence originated the Confraternity of the “Angelic Warfare,” for the preservation of the virtue of chastity. Having at length escaped, St. Thomas went to Cologne to study under Blessed Albert the Great, and after that to Paris, where for many years he taught philosophy and theology. The Church has ever venerated his numerous writings as a treasure-house of sacred doctrine; while in naming him the Angelic Doctor she has indicated that his science is more divine than human. The rarest gifts of intellect were combined in him with the tenderest piety. Prayer, he said, had taught him more than study. His singular devotion to the Blessed Sacrament shines forth in the Office and hymns for Corpus Christi, which he composed. To the words miraculously uttered by a crucifix at Naples, “Well hast thou written concerning Me, Thomas. What shall I give thee as a reward?” he replied, “Naught save Thyself, O Lord.” He died at Fossa-Nuova, 1274, on his way to the General Council of Lyons, to which Pope Gregory X. had summoned him.